The fee of 800 EURO covers the local costs in Erice including full board and lodging. Lunch and dinner will be provided at local restaurants. Drinks, beverages, and after-dinner coffee at the restaurants, telephone calls, personal laundry, etc. are not covered. Note that each accompanying person has to pay the fee as well. The fee can be paid by bank transfer or in cash. No credit cards are accepted! When the payment is made, you have to indicate "ISNP- 2018-your_name" (e.g. "ISNP- 2018-Smith"; ISNP="International School of Nuclear Physics") as the purpose of the transfer. Please make the transfer at least three weeks in advance in order to be sure that the payment arrived in Erice at the start of the School. Evidence of payment (a bank confirmation) must be provided at the time of registration in Erice. Otherwise the Centre will charge you 800 Euro in cash. The bank statement should also be used for refunding your travel expenses at home because the centre has sometimes difficulties to prepare a receipt before you leave. Payment in cash (Euros only) is possible. In order to arrange the transportation from the airport in Palermo or Trapani to Erice and to reserve the rooms in Erice, the "Ettore Majorana Foundation and Centre for Scientific Culture" needs your exact arrival and departure information (times and flight numbers, accompanying persons, etc.). To provide this information we ask you to use the following web link, which will be open until August 20 (deadline). If you do not fill in the form by August 20, we will assume that you do not come and cancel your participation. Busses will leave Palermo airport on September 16 in the afternoon. These busses will be arranged according to your arrival information. Transportation from Trapani airport will be arranged as well. 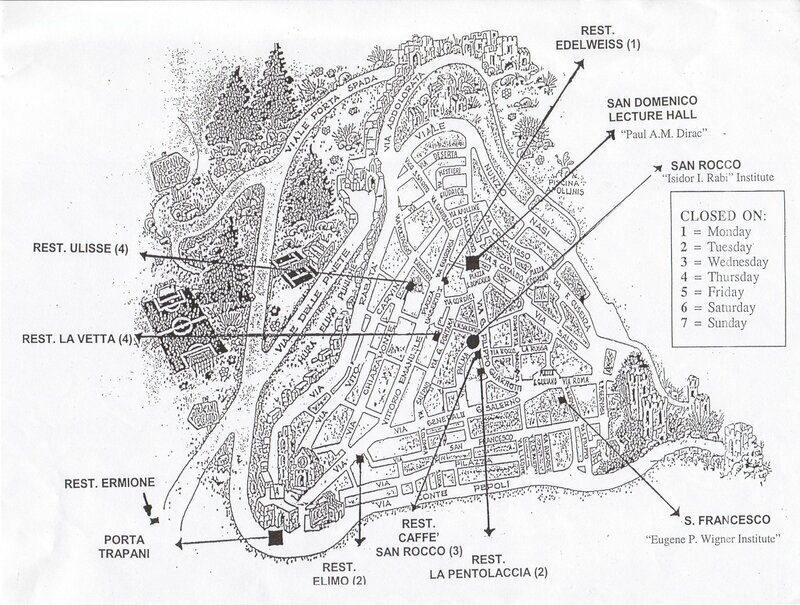 Registration and room allocation is upon your arrival on September 16th at the secretariat of the School ("San Rocco", Via Guarnotta 26, Erice, see Map of Erice). Please, do not try to make reservations directly at hotels in Erice. Participants will be accommodated in rooms with one or two beds, the majority with shower or bath. Transportation to the airport on September 24 will be organized during your stay in Erice. Transportation on other days is in your own responsibility. Operations in Erice are managed by the Director of the Ettore Majorana Foundation and Centre for Scientific Culture, Mrs. Fiorella Ruggiu (telephone: +39 0923 869107) to whom you should refer for any specific needs. Several personal computers as well as WLAN access are available at the Centro Ettore Majorana. Stand-alone capabilities for projecting powerpoint or pdf talks are available at the lecture hall. The presentations should preferentially be uploaded via memory stick. It is also possible to use personal laptops. The talks will be made available online. There are no longer printed proceedings. We will have an excursion to the Duomo in Monreale with the largest and perhaps the nicest mosaics and with the tombs of the Normanic kings Roger I and II and William I and II and the Cloister in Monreale. In Palermo we visite the Palazzo dei Normani with the Capella Palatina and, if you like, also the catacomi of the Convento dei Capucini with about 2000 preserved death persons standing and sitting. It is also a must to visit the Cathedral in Palermo with the tombs of Federico secondo (Frederick II; stupor mundi), German Emperor and king of both of Sicilies (1194 to 1250) and his father Henry VI, his mother Konstanze and his first wife. One afternoon, we will go the nicest sand beach of Sicily in San Vito lo Capo. Umbrellas and beach chairs will be available at no cost for you. Upon arrival you will receive a badge, which allows you to have lunch and dinner in about 10 restaurants in Erice. A list of these restaurants will be provided by the Centro Ettore Majorana. Drinks and beverages are not included. Lunch is typically between 13 and 15 h and dinner between 20 and 22 h.
Breakfast for the participants staying in one of the three former monasteries (San Rocco, San Francesco and San Domenico) is between 7:30 h and 9:00 h in San Rocco. Participants in hotels have breakfast there. During the whole day you can find food, coffee, fruits, and mineral water in the breakfast room in San Rocco. take the ferry-boat either from Genova or from Naples to Palermo, and then drive on to Erice (about 120 km from Palermo). The places on the ferry-boats from Genova or Naples should be booked in advance. From Milan-Rome via Messina you can reach Trapani directly. To Palermo or Trapani. For arrival and departure at normal times (September 16th and September 24th) the School will make local transport arrangements, see above. In September the weather is pleasant in Erice, but cooler than in the rest of Sicily since it lies at 750 metres above sea level.